Back in olden days, mom would put Junior down for a nap and the sound of his wailing, or her sixth sense, would tell her he was ready to get up. As houses got larger, and technology got smarter, Mom and Dad or the babysitter began to rely on electronic monitoring devices. As with many inventions, however, baby monitors sometimes come with unintended, disastrous consequences. On November 21, 2013, the Consumer Product Safety Commission (CPSC) issued Recall No. 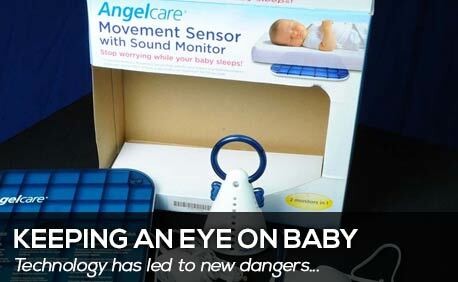 14-028 for the Movement and Sound Monitor manufactured by Angelcare because of infant deaths associated with its use. This device includes a sensor pad which is placed under the crib mattress. An attached 11-foot electrical cord goes to a transmitter which alerts parents of movement in the crib. The problem is that children are being strangled on the cord. One of the children was a 13-month-old girl who died in San Diego in November 2011. Angelcare has settled a claim against it in that case. Previously, an 8-month-old girl had died in Salem, Oregon. The 600,000 recalled baby monitors were sold at Babies R Us/Toys R Us, Burlington Coat Factory, Meijer, Sears, Walmart, Amazon.com, Target.com, Overstock.com, and nearly 70 small baby specialty stores, from October 1999 through September 2013 for about $100 to $300. CPSC Release No. 11-127, dated February 11, 2011, dealt with the Summer infant video monitor. The Summer baby monitors included a camera to be placed in the baby’s room and a hand-held device on which the caregiver could see and/or hear the baby. They were sold at major retailers, mass merchandisers, and juvenile products stores nationwide for between $60 and $300. Two strangulation deaths were reported in 2010 when the camera and its cord were placed within reach of the child. In one instance, the camera had been placed on top of the crib rail; in the other, it was placed on the changing table attached to the crib. A third child was lucky to escape injury when he was found with the camera cord wrapped around his neck; in that situation, the monitor camera was mounted on the wall but the child was able to reach the cord. If you have a small child in your home, or you know someone who does, please protect these little ones by visiting the CPSC website for assistance: http://www.cpsc.gov/onsafety/2013/11/baby-movement-monitor-recall-a-cord-issue/. BabyMonitorSafety.org also offers valuable tips for parents: http://babymonitorsafety.org/retailers. Immediately check the location of all monitors and other products with electrical cords–including those mounted on the wall–to make sure cords are out of your child’s reach. Place cords at least three feet away from any part of the crib, bassinet, play yard or other safe sleep environment.